Defender Andrea Dossena has left Liverpool and signed a four-year contract with Napoli. Napoli, who are fourth in Serie A, said they had reached a deal with Dossena to the end of the 2013-14 season. The 28-year-old joined Liverpool from Udinese in 2008 for £7m but has made only 30 appearances, scoring two goals. "I am happy to be able to wear the Napoli shirt. I have chosen a place of great prestige with big plans," the left-back told Napoli's website. "I can't wait for the time to play at the San Paolo in front of an extraordinary public." 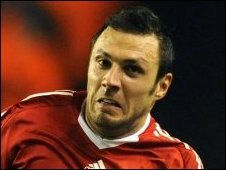 Dossena could make his debut on Sunday at home to Sampdoria. Out-of-favour striker Andriy Voronin looks set to follow Dossena out of Anfield with a £2m switch to Dynamo Moscow nearing completion. The Ukranian has scored only five times for the Reds since signing from Bayer Leverkusen in 2007 and spent much of last season on loan at Hertha Berlin.